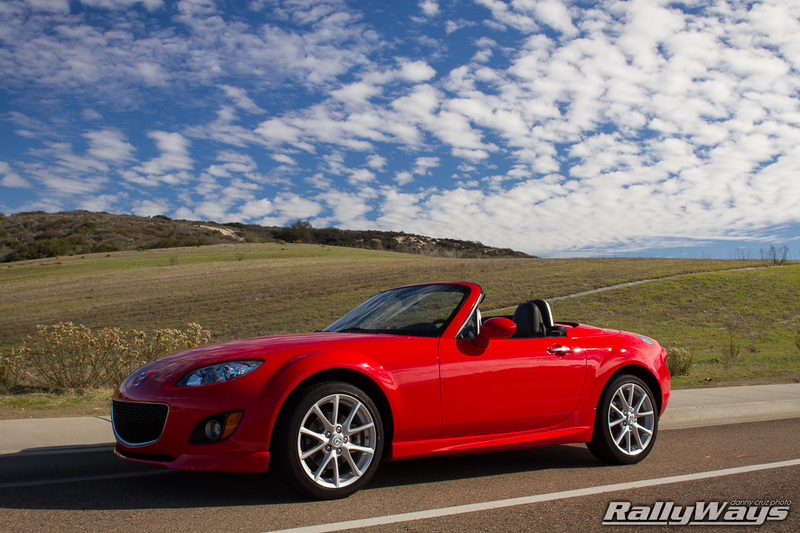 Since this is our own Mazda MX-5 Miata NC we got to know her very well from every angle. We know from what angle she looks best and under what circumstances. This photo was taken roughly at 10AM when the soft morning light was beginning to make way for the harsh noon lighting. In SoCal, we usually don’t get these types of puffy-cloud blue skies. It’s just usually just clear blue with no clouds, or grey during the overcast season. However, it had just been raining a few days prior to this photo and the remaining humidity brought along this beautiful scenery. We just happened to be driving back from Cbad Cars and Coffee Carlsbad that morning and upon passing this meadow we realized how gorgeous it all looked. So we stopped, turned around and snapped this photo. A circular polarizer helped make the skies pop. The wide angle lens, a Canon EF 24mm f/2.8 IS USM allowed the width to capture as much of the sky as possible without distorting things too much. The lighting is a bit harsh but the strength of the rest of the image more than makes up for it.